Diane Skinner (MASSD01) tells us about her journey after IDS and her new conservation work with painted wolves. Image: Painted wolves by Nicholas Dyer. Ten years ago, having spent a wonderful year at IDS on the MA Science, Society & Development, I was staying with my cousin in London, temping while I applied for conservation jobs in eastern and southern Africa. A two hour phone interview with the Chair of IUCN’s African Elephant Specialist Group resulted in a job offer, a flight home to Zimbabwe to swap winter clothes for summer, and arrival into a very rainy Nairobi. I spent a wonderful six years with the Specialist Group, traveling throughout sub-Saharan Africa and learning all about the ins and outs of elephant conservation and all the associated policies and politics. I was able to use much I had learned at IDS, as my job sat right on the interface between science and policy, especially as the poaching crisis escalated across the continent. Four years ago, I moved back home to Zimbabwe, taking the plunge to work as an independent consultant. My work has kept me traveling throughout the region, but it has also been wonderful to work on Zimbabwean projects, including rhinos, elephants, birds, and most importantly, the future of community conservation in the country. Of course, the last year has been a bit of a rollercoaster in Zimbabwe, with major changes we thought we would never see, spanning the spectrum from euphoria to uncertainty and back again. 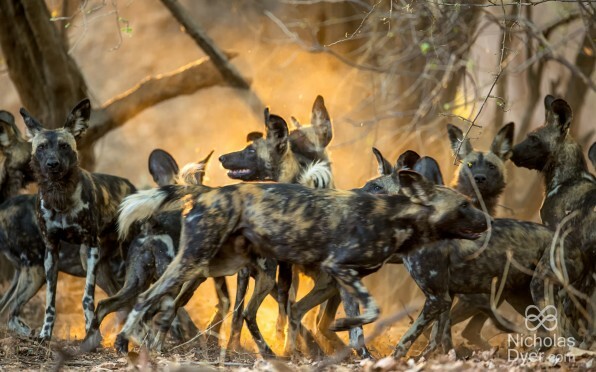 The year has also seen a major change in my life, as I have started to work on another highly charismatic, but atrociously neglected species, the ‘painted wolf’ (Lycaon pictus, also known as wild dog, painted dog and Cape hunting dog, amongst many others). Treated by colonial governments as vermin, the species has been extirpated from much of its range, persisting in just a few countries. It is in fact rarer than the rhino and lion, and certainly the elephant! Yet, there are few NGOs working to conserve them, and very little global knowledge about the species or its plight. I have joined forces with conservationist Peter Blinston and wildlife photographer Nicholas Dyer to form the Painted Wolf Foundation, whose aim is not only to raise funds to support those few outstanding organisations working in the field to save them, but perhaps even more importantly, to raise global awareness about the species, and to place them onto the global conservation agenda.